Produced by Golden Software, Surfer 12 software’s sophisticated interpolation (eg. kriging) engine transforms your XYZ data into publication-quality maps. Surfer provides more gridding methods and more control over gridding parameters, including customized variograms, than any other software package on the market. 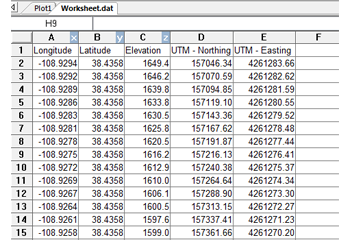 You can also use grid files obtained from other sources, such as USGS DEM files or ESRI grid files. 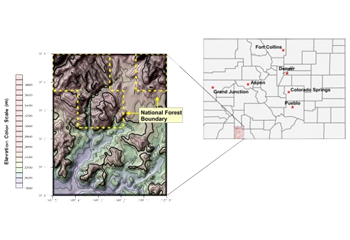 Display your grid as outstanding contour, 3D surface, 3D wireframe, watershed, vector, image, shaded relief, and post maps. Add base maps and combine map types to create the most informative display possible. Virtually all aspects of your maps can be customized to produce exactly the presentation you want. With help from GroundwaterSoftware.com and Golden Software's Surfer 12 software generating publication quality maps has never been quicker or easier. Display contour maps over any contour range and contour interval, or specify only the contour levels you want to display on the map. 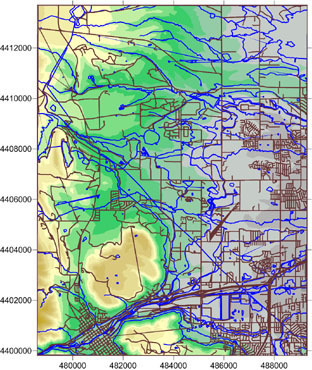 And with Surfer 12 software's easy map contouring you can add color fill between contours to produce dazzling displays of your maps or groundwater modeling, or produce gray scale fills for dramatic black and white printouts. This process transforms your data interpolation (eg.kriging) into brilliantly colored models. 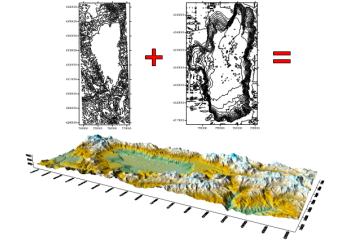 Surfer 12 Software can import maps in many different formats to display geographic information, including groundwater modeling. You can combine base maps with other maps in map overlays, or can create stand-alone base maps independent of other maps on the page. You can load any number of base maps on a page for optimum manipulation of your data interpolation (eg. kriging). It is easy to overlay a base map on a contour or surface wireframe map, allowing you to diversify your mapping and display geographic information in combination with the three dimensional data. 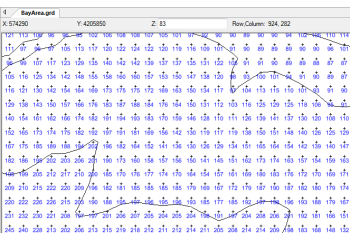 Instantly create vector maps in Surfer 12 Software to show direction and magnitude of data at points on a map. You can perform vector mapping from information in one grid or two separate grids. 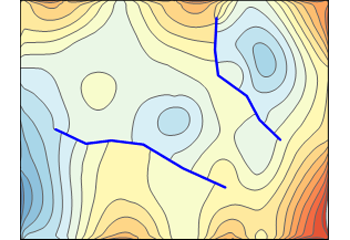 The two components of the vector mapping, direction and magnitude, are automatically generated from a single grid by computing the gradient of the represented surface. Surfer's automatic profile tool makes it easy to visualize the change in Z value from one point to another. Simply select the map, add a profile, and draw the line on the map. Include as many points as you want in the line; it could be a simple two-point line, or a zig-zag shape. In all cases, the profile is created showing the Z value change along the length of the line. Reshape the line on the map, and the profile automatically updates. Use the variogram modeling subsystem to quantitatively assess the spatial continuity of data or data interpolation (eg.Kriging). Variograms may be used to select an appropriate variogram model when gridding with the Kriging algorithm. Surfer uses a variogram grid as a fundamental internal data representation and once this grid is built, any experimental variogram can be computed instantaneously. Surfer 12 Software lets you massage your data in many ways to achieve the exact output you want. Your data interpolation (eg.Kriging) can now be fully manipulated. Surfer includes a full-featured worksheet for creating, opening, editing, and saving data files. Data files can be up to one billion rows and columns, subject to available memory. You can cut, copy, and paste data within the Surfer 12 worksheet or between applications. 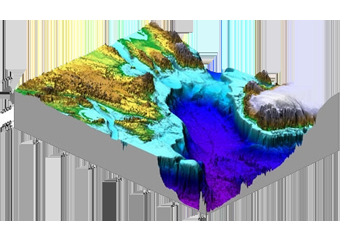 The 3D surface mapping uses shading and color to emphasize your data features. Change the lighting, display angle and tilt with a click of the mouse. Overlay several surface maps to generate informative block diagrams. Post maps show XY locations with fixed size symbols or proportionally scaled symbols of any color. Create post maps independent of other maps on the page, or combined with other map layers. For each posted point, specify the symbol and label type, size, and angle. Also create classed post maps that identify different ranges of data by automatically assigning a different symbol or color to each data range. 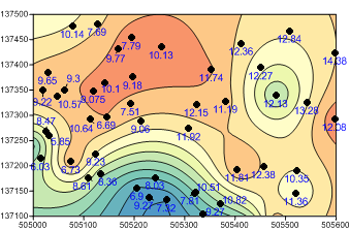 Post your sample locations, well locations, or original data point locations on a contour map to show the distribution of data points on the map. 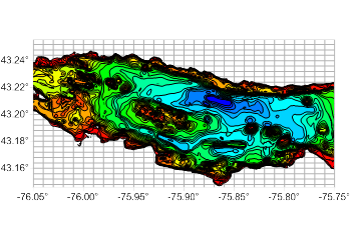 This demonstrates the accuracy of the gridding methods and groundwater modeling that you use. Adding multiple map layers to your map gives you a way to combine different types of data in one map. For example, you can drape a georeferenced image over a 3D surface map, overlay multiple base maps with a contour map, or plot a post map by contouring over a wireframe map. And because you can add any number of map layers to a map, you can show any amount of data on a single map. With help from GroundwaterSoftware.com and Surfer 12 (Produced by Golden Software) you are limited only by your imagination! Make your map look its best by customizing it to fit your needs! Surfer 12 offers numerous map features to enhance the look of your map. Use Surfer 12’s defaults, or customize your map by including scale bars, editing colors, lines and fill styles, showing only portions of a map, adjusting the scale and setting axis properties! Define faults and breaklines when gridding your data. Faults act as barriers to the information flow, and data on one side of the fault will not be directly used to calculate grid node values on the other side of the fault. Breaklines include Z values. When Surfer sees a breakline, it uses the Z value of the breakline in combination with nearby data points to calculate the grid node value. Unlike faults, breaklines are not barriers to information flow and the gridding algorithm can cross the breakline to use a point on the other side to calculate a grid node value. Use breaklines to define streamlines, ridges, and other breaks in slopes. 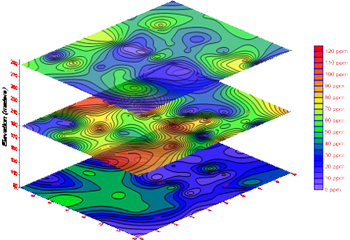 The gridding methods that support faults are: Inverse Distance to a Power, Minimum Curvature, Nearest Neighbor, and Data Metrics. The gridding methods that support breaklines are: Inverse Distance to a Power, Kriging, Minimum Curvature, Nearest Neighbor, Radial Basis Function, Moving Average, Data Metrics, and Local Polynomial. The object manager and property manager makes the editing of any object simple. The object manager displays all the objects in the plot document in an easy-to-use hierarchical tree arrangement. Double click on objects in the object manager to easily edit them, check or uncheck the check boxes next to their name to show or hide them, drag and drop objects to rearrange the order in which they are drawn, and overlay maps by dragging and dropping map layers from one map frame into another! Select any object or map layer in the object manager for easy deletion. When an object is selected in the object manager, changes to the object can be made in the property manager. The property manager is a docked window that is always displayed on the screen. You can make the property manager floating or close it, if you do not want it to display. All of the properties for an object are listed in the property manager. 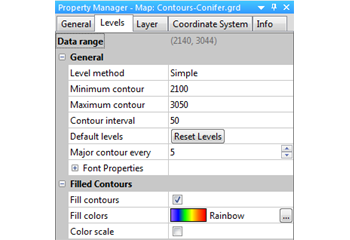 For instance, the Contours layer is selected in the object manager in the image below, and you can change the map contouring properties in the property manager. Once the change is made in the property manager, it is immediately applied in the plot window. 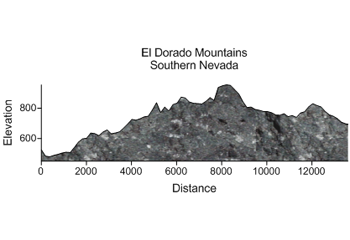 Surfer 12 image mapping uses different colors to represent elevations of a grid file. Surfer 12 automatically blends colors between percentage values so you end up with a smooth color gradation over the entire map. You can add color anchors at any percentage point between 0 and 100. Each anchor point can be assigned a unique color, and the colors are automatically blended between adjacent anchor points. This powerful feature allows you to create color maps using any combination of colors. Add a color scale to show the values of the different colors! 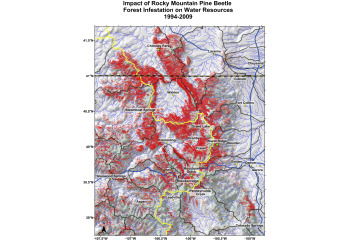 Image maps can be created independently of other maps, or can be combined with other map layers. They can be scaled, resized, limited and moved. 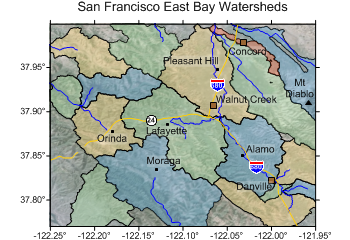 Watershed maps automatically calculate and display drainage basins and streams from your grid file. Create colorful watershed maps to display regions draining into a stream, stream system or body of water. 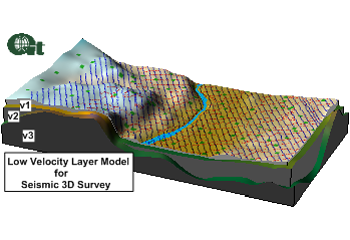 Display the catchment basins, streams, or both to fully integrate your groundwater modeling. Export the basins and streams to any supported file format, including SHP and DXF files, for use in other software! Surfer 12 uses the accurate eight-direction pour point algorithm to calculate the flow direction at each grid node. You can align individual maps horizontally on the page by stacking them. Map stacking was designed to align maps using commensurate coordinate systems. This command is useful for keeping two or more maps separated vertically on the page while keeping relative horizontal positions. The gridding methods in Surfer 12 allow you to produce accurate contour, surface, wireframe, vector, image, and shaded relief maps from your XYZ data. 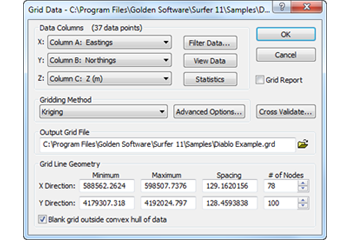 The data can be randomly dispersed over the map area, and Surfer 12's gridding will interpolate your data onto a grid. Use Surfer 12’s default settings for interpolating data or choose from twelve different gridding methods. 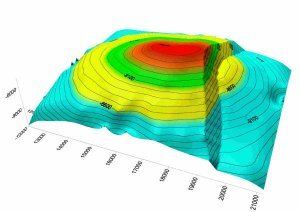 Customizng your groundwater modeling has never been more simple. Each gridding method provides complete control over the gridding parameters, so you can produce exactly the map you want. If your data are already collected in a regularly spaced rectangular array, you can create a map directly from your data. Computer generated map contouring has never been more accurate. 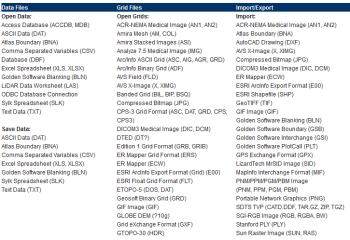 In addition to mapping and interpolating data, you can perform a variety of functions using grid files. Create your own scripts to automate repetitive tasks! Don’t spend time doing the same process over and over again – write a simple script to simplify your life! Operations performed interactively can be controlled using an automation-compatible programming language such as Visual Basic, C++, or Perl. 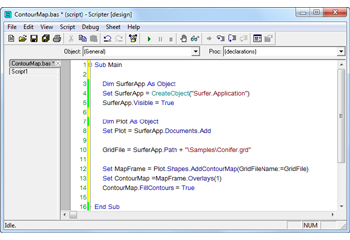 Surfer includes Scripter, a built-in Visual Basic compatible programming environment that lets you write, edit, debug, and run scripts. Why do more work than you need when you have Surfer working for you! 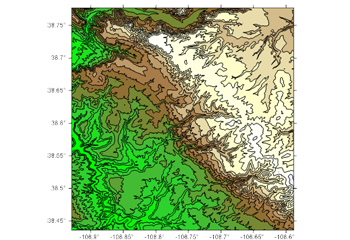 Shaded relief maps are raster images based on grid files. Colors are assigned based on slope orientation relative to a light source. Surfer 12 determines the orientation of each grid cell and calculates reflectance of a point light source on the grid surface. The light source can be thought of as the sun shining on a topographic surface. Surfer automatically blends colors between percentage values so you end up with a smooth color gradation over the map. You can add color anchors so each anchor point can be assigned a unique color, and the colors are automatically blended between adjacent anchor points. This allows you to create color maps using any combination of colors. 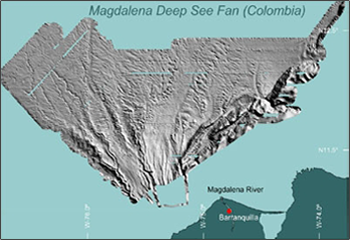 Shaded relief maps can be created independently of other maps, or can be combined with other layers. 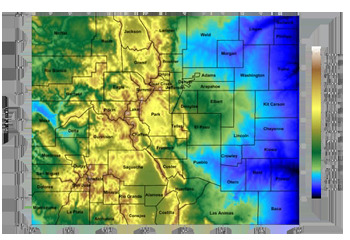 Shaded relief maps can be scaled, resized, limited, and moved in the same way as other types of maps. With the help of GroundwaterSoftware.com your maps can be even more sophisticated than before. Surfer 12 wireframe maps provide an impressive three dimensional display of your data. Wireframes are created by connecting Z values along lines of constant X and Y. Use color zones, independent XYZ scaling, orthographic or perspective projections at any tilt or rotation angle, and different combinations of X, Y and Z lines to produce exactly the surface you want. Drape a color-filled contour map over a wireframe map to create the most striking color or black-and-white representations of your data. By using GroundwaterSoftware.com and Surfer 12 the possibilities are endless. Choose from an endless list of coordinate systems for your map to display. Specify the source coordinate system for each of the layers in your map, and choose to display the map in any other coordinate system! For example, load data and grid files in UTM or State Plane coordinates, and display the map in Latitude/Longitude coordinates! It is simply that easy! Create custom coordinate systems by defining projection and datum parameters, and save the coordinate system for future use. You can also assign coordinate system information to your grid or data file and save it as an external file for future reuse. Clean up your grid with the grid node editor! Surfer's powerful grid node editor allows you to view and edit each individual grid node in a grid file. You can edit the grid node's Z value simply by selecting a grid node and entering a new Z value in the edit box. Grid nodes are represented by small black +'s, and blanked nodes (null values) are represented by blue x's, so it is easy to see your exact data. Use USGS Digital Elevation Model (DEM), National Elevation Dataset (NED) and NASA Shuttle Radar Topographic Mission (SRTM) data with any Surfer command that uses grid files. Directly use the files in native format without modification or conversion. Display information about the files, such as X, Y and Z extents or grid statistics. Create contour, vector, shaded relief, image, 3D surface, and 3D wireframe maps from the files.